There is a unique challenge to design single speed frames with rear disc brakes. To achieve proper chain tension, an eccentric bottom bracket shell can be used but they are heavy and become hard to adjust when dirty. Another disadvantage with an eccentric is that it's off-center approach changes frame geometry by lifting/lowering BB height (as well as head and seat angles) to get proper chain tension. Alternately a horizontal dropout with an axle adjustment screw can be used which is very common on BMX and track bikes. Disc Brake Dilemma: The ISO Disc Brake Standard requires that the (2) disc brake mounting holes are centered/keyed off of the rear axle centerline. These mounting holes are thus 'fixed' into proper position on standard hardtails with simple disc tabs. With horizontal dropouts, adjusting the rear axle to tension the chain causes the caliper to de-align and ultimately lose contact area to the rotor...not good. One solution: add slots to the ISO disc tab; this strategy is undesirable since the fixing bolts can slip under heavy braking loads. Sliding dropouts provide modularity to the single speed frame design by allowing different 'sliders' to be mounted to the frame. The chain is tensioned by using a single bolt to push the axle rearward (like BMX and track bikes). For disc brake applications, the 'disc slider' and rear axle move rearward at the same time in order to maintain proper caliper and rotor alignment (while satisfying the ISO Standard). One more benefit is that the 'disc slider' is designed with vertical axle entry in mind - sweet! For steel frames, sliding dropouts are readily available from Paragon and they work nicely. 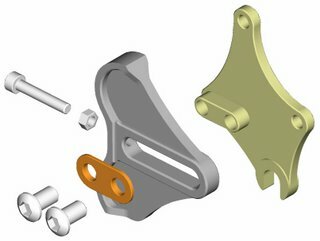 For aluminum frames, there are no 'off the shelf' dropouts that fit the bill. So I decided to design my own version machined from 7005 billet aluminum. The exploded view above shows the 'disc slider' in yellow and the 'horizontal dropout' in dark gray. The parts mate together using (2) M6 button head screws and there is a brass 'wear guide' shown in orange which prevents the frame from getting damaged when tightening the assembly. The 'disc slider' and rear axle are positioned using (1) M5 socket head cap screw and jam nut....this motion is what ultimately tensions the chain. For simplicity, the 'horizontal dropout' is identical on both left and right sides. The round 'hoods' mate easily to round or square stays with a 3/4" radius. No weight reduction pockets are planned for this part since it needs to maintain structural integrity. 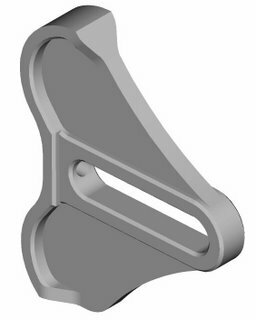 For my latest single speed frame design, I plan on using square stays and machined yokes to provide excellent stiffness and immediate acceleration when riding. Due to their modular nature, sliding dropouts from Ahrens Bicycles save time during the frame building process and offer the end-user a simple solution when running disc brakes! Stay tuned for prototypes which will be ready in May 2006.